“I came here afraid of the water only left committed to free diving. WOW! This has been a deeply moving life affecting experience for me. “It was a great experience. Kwab was extremely calm, patient & informative. A good teacher. Matthew displayed excellent knowledge, has great teaching style and runs a very good yoga lesson. Ketut & team in the cafe have a great cheerful demeanor & were very professional, enforcing the “no coffee before freediving rule”. Cafe food was excellent. Location is excellent & business appears to fit in well with the community. The has a very cooperative feel which can be hard in a small business or any business. The affiliative/efficient & professional dynamic is visible & clearly should be maintained. This team has a good ambience. I also enjoyed hearing about all team members’ background, philosophy, & values from rehab work, thoughts on dhamma meditation, yoga, recommendations on places to eat, corporate crime to the greens (?). The bunch are collectively mindful, considerate, compassionate & intelligent. “I’m sure there are other excellent teachers around the world, it’s clear to me that I should learn to freedive with you. “I met my goals and even more. I’ve learned a lot from yoga and relaxation- I didn’t come for that purpose and the fact that I could directly see the effect of this practice into freediving was a pleasant and nice surprise. That has for sure opened my mind on this practice for other sports. I also have gone deeper in sea than what I could imagine in easy way and get rid of my fear…so much to say…. “Great course! A life discovery! Great teacher, very good teaching skills, professional, reassuring, patient to answer all the questions. We’re organising group trips to freedive with Mantas and other pelagics on the amazing reefs of Nusa penida, starting in May. We are teaming up with Graham Abbot, one of the most respected specialist dive guides in this incredible area to offer something really special, freediving, yoga and Scuba trips to the Eastern Dive Jewels of Indonesia. From the 7th to the 12th and from the 15th to the 22nd of September Acroyoga and freediving intensives…with the amazing Bex Tyrer, Bali’s queen of acroyoga. This practice is a beautiful hybrid of acrobatics, yoga and Thai massage with one person ‘flying the other’ with another acting as a spotter.. 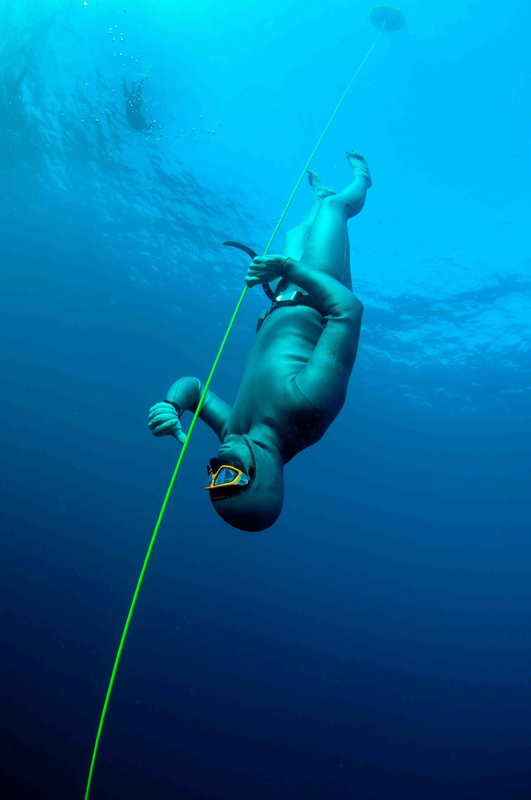 It is the perfect complement to freediving in every way, we are pretty excited about this. Another bit of news is that we are now offering SSI certification alongside our own Apneista training system. We will continue to do what we do best, adapting training to suit the individual and expanding our curriculum, but now for those interested in Global certification we now offer SSI training as well. For those who want to get signed off for SSI,we will be running one day SSI assessments during May. New training space, yoga sala, cafe, equipment shop and more training lines. P.S. anyone with 5 minutes to spare and with great things to say about us here’s a link to tripadvisor, your help is sincerely appreciated. Coming very soon… The best Master freediving course in Asia, with optional Yoga and meditation training. In the last year we have been so taken up with the building of our new training space that we have resisted taking on Master students. We didn’t want to take on Master freediver students while there was still ongoing refurbishment and the possibility of people having a less than perfect Master freediving course.